Here is a short tutorial on how to set any image as the background image of Windows 8 Start Screen. Windows 8 Start Screen is the first screen we see when we login to Windows, and to which we switch very often while working on Windows 8. Though we can easily customize this Start Screen by changing its background, Windows somehow, limits this feature by providing just 20 backgrounds that can be replaced by the Start Screen image. But there’s a good new. If you want to use your own photo as your Start Screen background, you can do that by using a small freeware called Win8StartScreenCustomizer. 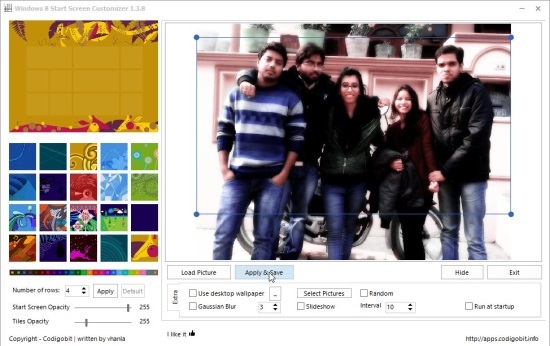 This lightweight software (size around 1.52 MB) allows you to choose ANY photo and set it as your Start Screen image. Win8StartScreenCustomizer can be downloaded using the link given at the end of this article. Let’s see how you can use it to customize your Windows 8 Strat Screen. Win8StartScreenCustomizer is very handy and easy to use. The main interface of the program, as can be seen from the screenshot below, contains a list of Window’s default Start Screen backgrounds, a blank area to preview the selected image, and some setting options. To choose a custom image, you can click on the Load Picture button from the Settings panel and browse the image from your system. Once the image gets loaded, you can use the available rectangle to select a part of the image you want to set as your Start Screen background. Once you are done, you can click on the Apply & Save button to save changes. Win8StartScreenCustomizer will automatically switch to the Start Screen to show you everything is set as desired. Apart from simply setting an image as the Start Screen image, you can also tweak the Start Screen opacity, the Tiles opacity, change the number of rows on the Start Screen, and choose to play a slideshow on the Start Screen using Win8StartScreenCustomizer. Options for all these tweaks are available in the Settings panel. If you want to switch back to the default Windows backgrounds, you can click on the desired thumbnail from the list of available options on the left panel and click on Apply. Note: In order to make the changes permanent, you would have to click on the Run at Startup checkbox; otherwise the image would be replaced by the default background once the current session ends. 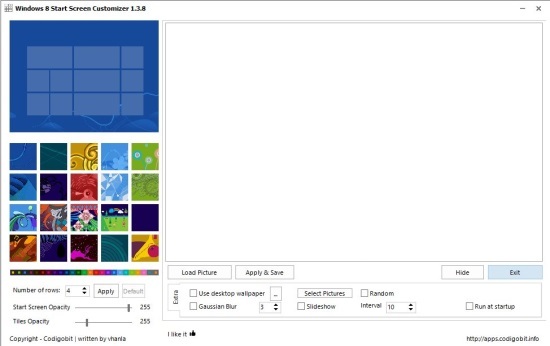 Free software to customize Windows 8 Start Screen. 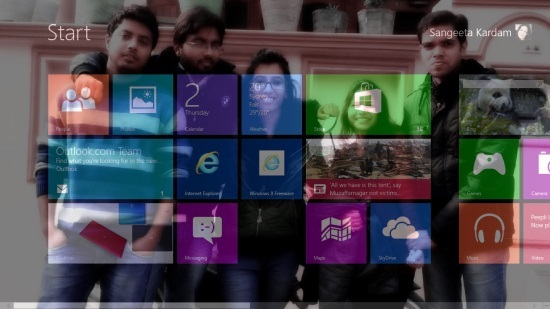 Set any picture as Windows 8 Start Screen background. Can change the opacity of Start Screen and Tiles. Can change the number of rows on Start Screen. Can play a Photo Slideshow on Start Screen. Can switch back to any Windows default Start Screen background from the program interface. Can change the Windows theme color. Can use the desktop background as Start Screen image. Option to Run on Startup. Option to Blur the background. Also check out how to change Windows 8 Lock Screen background. Win8StartScreenCustomizer is a very good software to give a personal touch to your Windows 8 system by setting any image as the Start Screen background. The additional settings are also praiseworthy. All in all, a must try for all Windows 8 users. Download free and try it now. Do share your thoughts about the same via comments.